If you thought you had seen the end of the zombie plague after escaping Banoi at the end of the original Dead Island, you’re wrong. In fact, it seems to be happening all over again. The ship your helicopter landed on hit a horrific storm and the zombie plague spread once more. In the midst of the mass confusion, the ship is wrecked and you find yourself washed ashore. And on the show floor of the Boston Convention Center, that’s where we found ourselves thrown into the world of Dead Island: Riptide. As our characters regain their senses, a local informs us of the spreading plague, urges us to get ourselves to safety, and to help others along the way. My first thought is to check my surroundings for supplies, and I’m successful in doing so, finding a pipe lodged among the wreckage. Because of the nature of the show floor, however, I don’t have much time. My companions are already rushing ahead, looking for more carnage. We continue trekking up the beautiful vista of Palanai – another island in the Banoi archipelago – and are relatively unsuccessful in finding further supplies. Our group of four began to discuss the distinct lack of zombies around when we stumble upon a refuge encampment, as it’s being overrun by a horde of zombies. Charging headlong into battle, we make do with what we have and attempt to save as many people as possible. Bashing heads in with pipes, brass knuckles, and more, we proceed to fight the horde back until the area is cleared. It was here that we were given free reign to fortify the area with fences, regather our strength and health, and search for more weapons. The infamous crafting table made it’s return as we upgraded our weapons with the supplies and money that we found lying around. It wasn’t before long, however, that the zombies fought back. We were forced to quickly evaluate whether or not we wanted to tear down a fence and let the horde in, or let fate decide which zombies broke through first. Relatively early on, it wasn’t all that bad, but eventually chaos loomed; the zombies broke through and we were once again forced to fight for our lives. Through much turbulence we found ourselves successful and lived to see another day before we were ushered off of the Xbox 360 stations which the game was being played on. 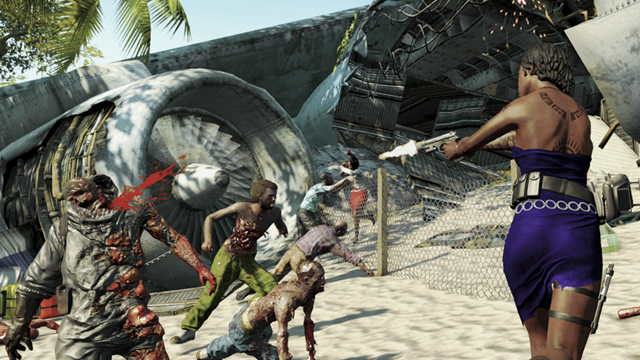 Dead Island: Riptide looks to continue the carnage that players of the previous installment came to know and love, but there are many improvements too. You can expect to return to the Banoi islands on April 23, 2013 on Xbox 360, PS3, and PC.